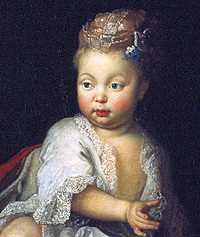 3 July: Princess Friederike Wilhelmine Sophie von Preußen is born in Berlin. 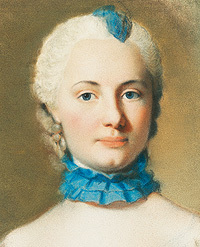 Her father is Friedrich Wilhelm (1713-1740, King of Prussia, the "Soldier King"), her mother Sophie Dorothea, daughter of Elector Georg von Hannover (1714-1727 King George of England). 21 January: Birth of Crown Prince Friedrich (1740-1786 King of Prussia, "Frederick the Great"); he was Wilhelmine's favourite brother. 3 June: Wilhelmine becomes engaged to the future margrave, Friedrich von Bayreuth. 7 May: After the death of his father Georg Friedrich Karl, Friedrich becomes Margrave of Bayreuth (1735-1763). 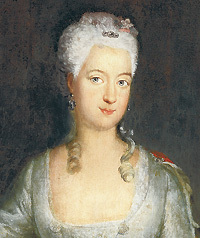 3 July: Wilhelmine's husband presents her with the Hermitage on her birthday, and she immediately starts to redesign it. Rebuilding of the Hermitage Old Palace commences. In 1737 the first Italian musicians come to Bayreuth. In the same year Wilhelmine takes over as director of the court opera. At the margravine's instigation, a "whole caravan" of Italian stage artists arrives in Bayreuth in 1738, including the composer Paganelli and the singer Giacomo Zaghini. Wilhelmine commissions her court architect Joseph Saint-Pierre to build an open-air theatre in the form of a ruin in the Hermitage Court Garden. In the Redoutenhaus (next to the future Margravial Opera House), Wilhelmine and Voltaire appear on the stage together ("Bajazet" by Racine). 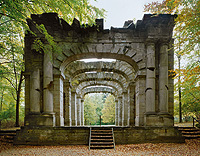 29 August: The theatre of the Hermitage, an imitation ruin, is used for a performance for the first time on the occasion of the marriage of Wilhelmine's sister Luise Ulrike. From 1744 to 1747 Wilhelmine writes her memoirs. Work begins on the Margravial Opera Hause; architects: Joseph St. Pierre (exterior) and Giuseppe Galli Bibiena together with his son Carlo (interior). Sanspareil, the first Chinese "Rock Garden" on the continent, is laid out under the direction of Wilhelmine; it includes a number of interesting architectural features. The distinctive features of the Hermitage, the Orangery and the Temple of the Sun, are built to Wilhelmine's specifications. The Margravial Opera House is completed. The groups of statues in the Hermitage Court Garden are erected from 1750-1752. The Chinese Mirror Cabinet at Hermitage Old Palace is furnished. The New Palace is begun in the same year, incorporating existing buildings; the north wing is designed by Wilhelmine herself. The first plans are drawn up for the Court Garden of the New Palace. Galleries are added to the ground floor and upper floor of the New Palace. Fantaisie Palace in Donndorf near Bayreuth, the future residence of Wilhelmine's daughter Elisabeth Friederike Sophie, is begun. 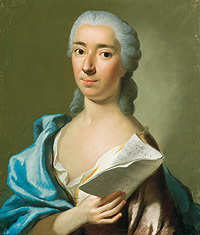 14 October: Margravine Wilhelmine von Bayreuth dies. From this point on there are no more performances in the opera house. Margrave Friedrich marries again: his second wife is Princess Sophie Caroline von Braunschweig-Wolfenbüttel, a niece of Wilhelmine's. The Italian Palace south of the New Palace is built as a residence for Sophie Caroline. 26 February: Margrave Friedrich von Bayreuth dies without a male heir. This is the end of the extravagant court life in Bayreuth. Friedrich Christian, an uncle of the margrave, becomes the next ruler. 20 January: Margrave Friedrich Christian dies without a male heir. 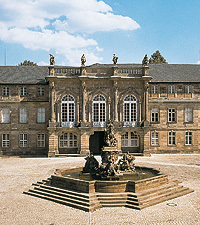 In accordance with a contract regulating succession dating from 1752, Bayreuth falls to Ansbach. Margrave Alexander is now ruler of both margraviates. 2 December: Margrave Alexander signs an abdication document in favour of Prussia. Prussia takes over the Ansbach-Bayreuth territories. In the course of the War of the Fourth Coalition, Ansbach-Bayreuth is occupied by French troops. Napoleon keeps Bayreuth for himself, placing it under French military jurisdiction. Bayreuth is ceded to Bavaria for a payment of 15 million francs.